Indian Head Cove was once one of Canada's hidden gems, now the vibrant turquoise waters draw in huge crowds during the summer. With gorgeous coves, well-preserved shipwrecks and ice-cream shops, the little-known Bruce Peninsula in Ontario is a wonderful place to spend a few days exploring. 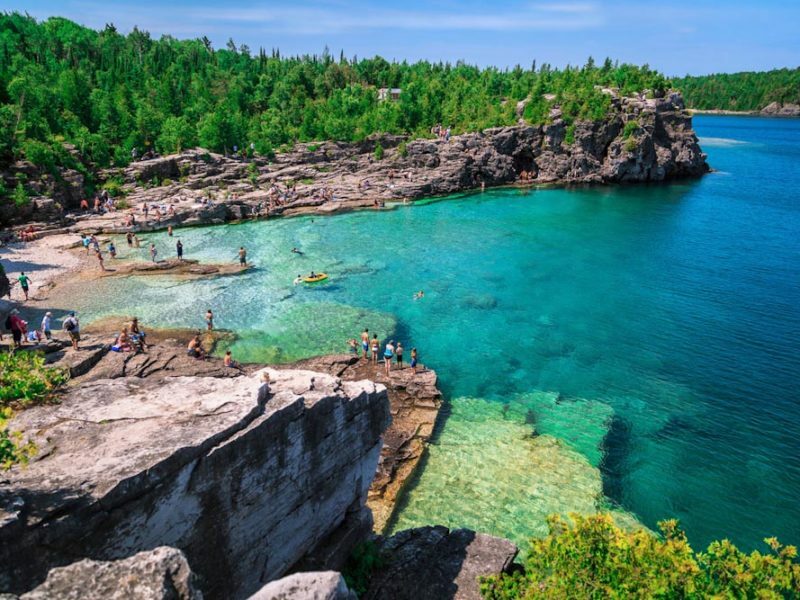 A few years ago, a photo of two girls swimming in Indian Head Cove, on Canada’s Bruce Peninsula, won a competition run as part of a tourism campaign to uncover the country’s best hidden gem. If you didn’t know better, you’d believe the picture was taken in the Mediterranean, thanks to the clear, turquoise water in the photo but, in fact, the cove is just a couple of hours’ drive northwest of Toronto. The 100-kilometre-long Bruce Peninsula, named after a British earl who was also governor of the Province of Canada in the mid-1850s, separates Georgian Bay from Lake Huron, the third-largest lake in the world which sits partly in the US. It makes up the northern section of the Niagara Escarpment, a rocky ridge of cliffs and rugged slopes which runs from Niagara Falls to the port town of Tobermory. 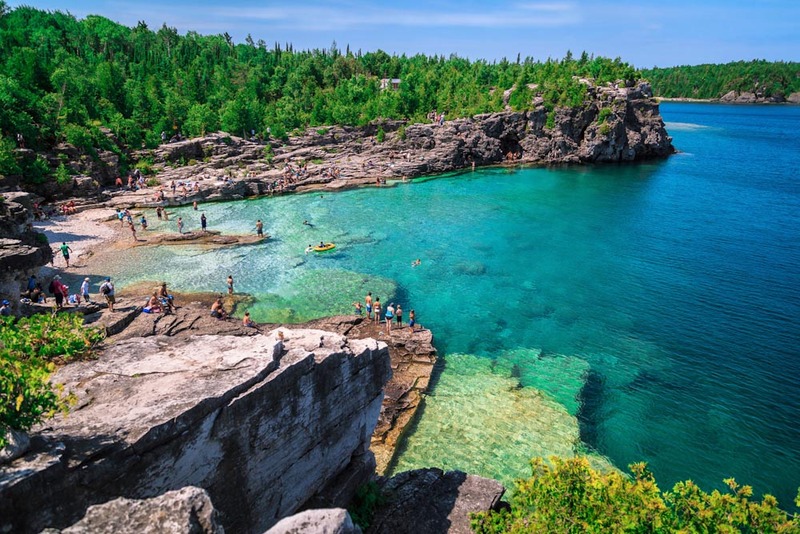 Bruce Peninsula National park has an epic 800-kilometer walk known as the Bruce Trail. An epic 800-kilometre walk called the Bruce Trail stretches the length of the escarpment and is well-known in the hiking community, but that’s about the extent of its fame. Since its hidden-gem status has been exposed, more and more people have discovered the Bruce Peninsula. Most of them come from within Ontario – so much so that it’s best to avoid visiting in summer, when one of the area’s main attractions, a swimmable cave pool known as the Grotto, can be particularly crowded. But it’s fair to say relatively few Australians venture to the region, so we’re here to spread the word. There are 22 shipwrecks to explore in the peninsula’s Fathom Five National Marine Park. During the logging boom at the end of the 19th century, logs were transported by boat, but the shallow lake was a difficult place to navigate – hence the wrecks. Explore two of the best, both lying in Big Tub Harbour, on a glass-bottomed boat cruise to Flowerpot Island – so named after the soaring seastack limestone. Keep an eye out through the glass for the 36-metre-long Sweepstakes, wrecked in 1885 after it hit a shoal, and the City of Grand Rapids, sunk in 1907 – its smokestack still pokes above the waterline. Tobermory is a thoroughly lovely place to base yourself in the Bruce Peninsula. The town is full of cute stores, including The Sweet Shop, which sells ice-cream and lollies named after local places and animals, and Shipwreck Lee’s Pirate Bistro, predictably but wonderfully decorated with pirate paraphernalia. At Tobermory Brewing Co and Grill, overlooking the harbour, brewmaster Morag Kloeze crafts beers in small batches with names inspired by the peninsula, such as The Bruce Trail Blonde Ale, the Fathom Five Porter and the Angry Logger Marzen. The restaurant serves locally sourced food, with a menu that includes beef carpaccio, vodka-smoked salmon roulade, organic manitoulin rainbow trout and bison burgers. There are 22 shipwrecks in Fathom Five National Marine Park, you can get close to 2 of the best from a glass-bottomed boat cruise to Flowerpot Island. On a 40-hectare forested property on the Georgian Bay shoreline that’s been in the family since the 1800s, E’Terra is a luxurious six-suite retreat. The main lodge is built around a waterfall rockface, with floors made of black stone from a nearby quarry and Douglas fir, pine, ash and cedar posts and beams salvaged from across Canada. Limestone walls surround the hearth in the dining room, and the suites have been named after local species: Beech Suite, Morel Suite and Calypso Suite. “The Bruce Peninsula is special because there are no big chain stores, fast food outlets or coffee shops,” E’Terra’s owner Laurie Adams says. Further south on the peninsula, Wiarton is famous for its weather-predicting groundhog, Wiarton Willie, who was around long before Punxsutawney Phil shot to fame in the Bill Murray movie Groundhog Day. He finally passed away in 2006 to leave his successors to predict, every year on 2 February during the town’s annual festival, whether there will be an early spring. Housed in an 1860s building, the nearby Big Bay General Store serves ice-cream made with a 50-year-old Taylor ice-cream machine that its previous owners found in the basement – you can also pick up preserves, maple syrup, arts and crafts here. Climb to the top of the restored 1859 Imperial Lighthouse for spectacular views of Chantry Island on the Bruce Peninsula. Down the road is the tranquil bay, which a sign also proclaims to be, serendipitously, the “stone-skipping capital of Canada”. Once you’ve done that justice, you can also climb to the top of the restored 1859 Imperial Lighthouse on Chantry Island to admire the views, before lining up for lunch at Gerry’s Fast Food on the beach in Southampton for homemade fries, mushroom balls and hot dogs. Air Canada flies to Toronto via Vancouver. From there you can hire a car, or take advantage of the ParkBus service to Tobermory. Ontario’s Tobermory is full of cute shops and is a lovely place to visit. E’Terra in Tobermory is a six-suite luxury retreat.